Bitbanger labs has got a bun in the oven. We’ve decided to finally dive headfirst in the 3d printing reprap world with a shiny new mendelmax. 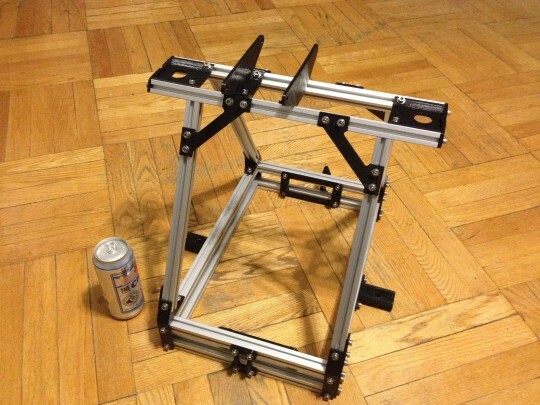 The mendelmax is a relatively new variant of the reprap which relies on slot aluminum instead of rods. This things looks like a beast, and after a few hours the frame went together with only minor swearing. We’ve got plenty of experience with slot aluminum and pulleys from building camera rigs, so fingers crossed that once the rest of the bits arrive everything else goes together as easily as the frame. Project Y nearing Kickstarter launch! Bitbanger Labs featured on ABC/Yahoo News! Bitbanger Labs © 2019. All Rights Reserved.